Buy now before 3pm for Royal Mail 1st Class Signed For delivery 1-3 days – Weekends & bank holidays excluded, get the best motor run capacitors money can buy. If you are not sure what to buy, email a picture of your existing capacitor. The best way to check is to buy a cheap capacitor tester and test the capacitor itself, if the capacitor is for example 16uF the reading must be plus or minus 5% of what uF reading the capacitor is. 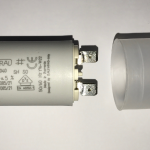 Many people end up installing flourescent light bulb capacitors as they are cheaper than motor run capacitors and they are not up to the job, install the right one first time for long lasting results.